Samsung has announced that in the 2nd quarter, it will start producing A 24-inch LCD panel with an LED backlight that enables computer monitors to deliver unprecedented color quality, resembling that of the highest-quality TV sets available today. The new LCD will be targetting technology demanding consumers like photographers, graphic designers, animators etc as they will enjoy the same true-to-life colors that premium LCD TVs can provide thanks to Samsung’s proprietary LED backlight. 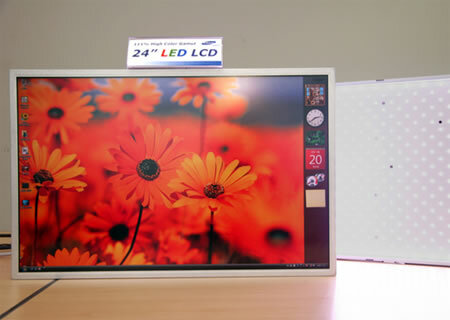 The LED-backlit monitor panel has an industry-high color saturation level of 111% (of NTSC standard) compared to a saturation level of only 72% of NTSC for conventional monitors and will satisfy consumers used to the crisp colors prevalent in high-definition broadcasting. Optimized for Windows Vista the LCD also features Samsung’s highly successful S-PVA (Super Patterned-ITO Vertical Alignment) technology that provides the widest viewing angle possible – 180 degrees – at the highest contrast ratio for LCD monitors today (>1,000:1). 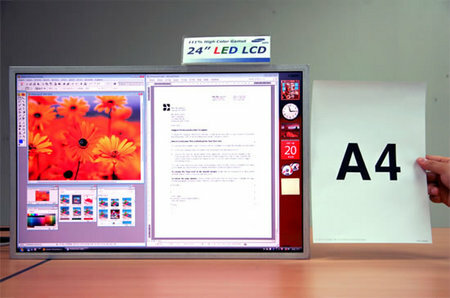 It also supports WUXGA resolution (1,920×1,200 pixels), which is the computer equivalent to Full HD resolution. Pricing and availability of the LCD is not known yet. I am waiting for a 40 inch LED backlit LCD TV set. Will it be this Year 2007? is CREE making the LED backlighting?